Although not a museum, the 1895 Renaissance Revival Boston Public Library is crammed with spectacular paintings, tapestries, architectural details, and sculpture - plus a fabulous 3rd floor gallery filled with John Singer Sargent murals. Even before you enter the building, you're surrounded by magnificent sculpture and architecture - and once you're inside, you'll see something splendid everywhere you look. But the art treasures are just the tip of the iceberg. 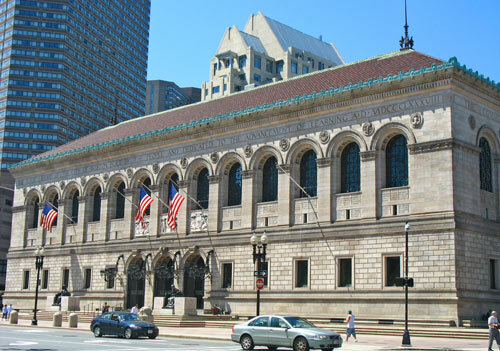 The Boston Public Library's vast collection contains over 1.2 million rare books and documents. Many of these are displayed on a rotational basis - so wander in at any time and you may see rare medieval manuscripts, first edition folios by William Shakespeare, records from Colonial Boston, centuries-old maps, and highest-quality Old Master prints. John Adams’ personal library is also housed here, as well as original music scores by Mozart, Prokofiev, and others. 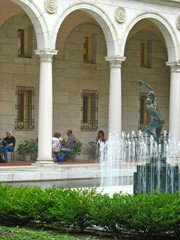 Aside from the treasures inside, Boston Public Library's two buildings are architectural gems. Famous Boston architect Charles Follen McKim designed the older one. This is the massive, rather imposing building that you see on the west side of Copley Square. McKim promoted his Renaissance Revival masterpiece - now called the McKim Building - as a “palace for the people” when it opened in 1895. Built from pale pink granite, many architects praise this Back Bay jewel for its perfect classical proportions. When more space became necessary, adding onto the McKim Building presented a huge architectural challenge. Should the new building copy or blend with the McKim? If so, would it always seem less beautiful - the less-attractive wanna-be younger sister of a world-famous beauty queen? If not, how could it be different without seeming jarring and out of place? In 1972, a modern addition designed by Phillip Johnson opened. You may not even notice it from the front of the library. To see it, walk down Boylston and perhaps cross the street to view it properly. At first, the Johnson Building, as it is called, looks very different. But take a closer look - it's built from the same pink granite and has the same monumental scale as the McKim Building—even though its square lines, angled walls, and plain facade provide an unmistakable late 20th contrast. You can't miss the arches - well, you can, but you shouldn't. Take a closer look, and you'll see that they sort of echo those of the McKim Building. Look some more - preferably with the McKim Building not in your line of vision, and you'll notice that the Johnson Building also has wonderful proportions. The light plays off its angles and curves in different ways throughout the day, and in different seasons. Without the over-the-top carvings and embellishments of the McKim Building, it may never capture our attention in quite the same way - but the Johnson Building does have its own claim to beauty. 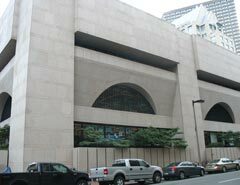 The Johnson building houses circulating materials and also serves as headquarters for the Boston Public Library's 28 branch libraries. The McKim Building holds the non-circulating research and reference collection, as well as much of the incredible art. 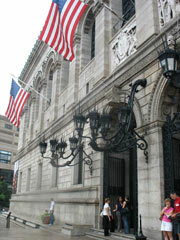 The Boston Public Library was founded in 1848 and opened in 1854 as the first large free municipal library in the U.S. It welcomes over 2.2 million visitors every year—researchers, art and architecture lovers, and Boston residents who simply want a quiet place to read or to find a book to check out and take home. The McKim Building looks imposing on the outside - partly because of its size. Once you go inside, you'll discover that it's actually warm and welcoming. As you walk up to the building, take a moment to admire the sloping red tile roof with its green copper. If you look up to the second story, you'll see names of great artists, scientists, philosophers, religious figures, and leaders under the arched windows. Three huge arches form the entrance, flanked by clusters of branching wrought-iron lanterns. 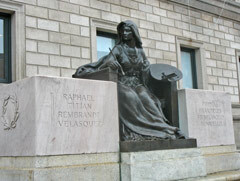 In front of the library, you'll see two large statues representing Art and Science. Look closely at the ornate bronze doors, and you'll find representations of Music, Poetry, Truth, Romance, Knowledge, and Minerva, the Goddess of Wisdom. In the entry, you'll see large bronze statues on either side, including Sir Harry Vane, governor of the Massachusetts Bay Colony from 1636 to 1637. Inside, there's almost too much to take in. On the white marble floor of the entrance hall, you'll find inlays of zodiac symbols and inscriptions. Look up, and you'll see names of 30 famous Bostonians on the vaulted ceiling. Walk around a bit and absorb the spectacular murals and mosaics, the enormous vaulted reading rooms, and the painted ceilings. Art, architecture, and engineering merge perfectly. Now, go up the staircase, and notice the fossil shells embedded in the marble. 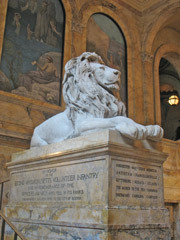 At the turn of the stairs, you'll see two enormous lions that commemorate Massachusetts Civil War infantry regiments. On both the second and third floors, you’ll find galleries with displays of the library’s rare books and fine art. The magnificent Bates Reading Room, named in honor of the Library’s first benefactor, occupies the entire front half of the second floor where light streams through the high arched windows. If you have a book with you, you can sit in here and read for awhile. On the third floor, you'll find the John Singer Sargent murals. The great American painter considered them his most important work, created over a period of 30 years. Titled “The Triumph of Religion” and painted in the style of Italian Renaissance frescos, the murals depict the development of world religions and are very different from his society portraits that you'll see in the Museum of Fine Arts. After experiencing the magnificence of the Library’s rich cultural treasures, be sure to find the Library’s peaceful inner Italian-style courtyard, surrounded by columns and arches designed to look like an arcade in the Palazzo della Cacciatella in Rome. Spend at least a few tranquil minutes enjoying the fountain and statue of "Bacchante and Infant Faun." The Boston Public Library has two restaurants on the first floor of the McKim Building. Although both restaurants are quite good, you can also do what a lot of locals do - buy a sandwich at a neighborhood deli and eat it at one of the tables in the courtyard. 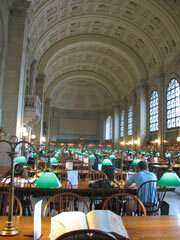 As an added benefit, the Boston Public Library offers free wireless Internet access. You won't find a more beautiful place in the city to hang out with your laptop. When the Library first opened in 1854, you had to be at least 16 to enter the doors. 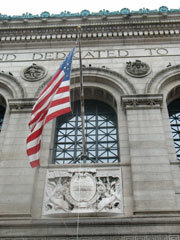 Now, the BPL offers excellent children's activities. If you're visiting with children, check the BPL website to see what children's programs will be offered during your stay in Boston. You can also find other free programs, lectures, and presentations listed on the BPL website.